Many months have passed. Much has happened and much has slipped from my memory. Insignificant details have stuck with me while important things have gotten away. Some things I know only from third parties and more I can only guess. How often have my witnesses perjured themselves? It did not occur to me, till this time of enforced inactivity befell me, that an important tradition was being overlooked, that no one was recording the deeds of the Company. I dithered then. It seemed a presumption for me to take up the pen. I have no training. I am no historian nor even much of a writer. Certainly I don’t have Croaker’s eye or ear or wit. So I shall confine myself to reporting facts as I recall them. I hope the tale is not too much colored by my own presence within it, nor by what it has done to me. With that apologia, herewith, this addition to the Annals of the Black Company, in the tradition of Annalists before me, the Book of Lady. Dreams of Steel (1990) picks up right after the end of the previous book, Shadow Games — which means it picks up in the middle of utter disaster. Under the command of Captain Croaker, the invigorated Black Company had marched south to contend with the armies of the Shadowmasters. In a stunning series of victories they crushed the Shadowmasters’ forces and by coup de main took the fortified city, Dejagore. The unexpected arrival of massive reinforcements under the Shadowmaster Moonshadow proved too much. Both Lady and Croaker appeared to be killed in the battle that followed. Under Lieutenant Mogaba the survivors retreated into the city and were besieged. In the last pages it was revealed Croaker wasn’t dead. He had been taken prisoner by Lady’s sister, Soulcatcher. This is very bad. She was Lady’s and the Company’s great nemesis and she had, or so everyone thought, been killed nearly twenty years before, at the end of the first book, The Black Company. And when I say killed I mean killed, complete with her head chopped off. Now she’s back with plans for vengeance against her sister, primarily by separating her from Croaker, the only man Lady’s ever loved. Lady awakens on the battlefield outside Dejagore surrounded by the dead and the dying. Fortune seems to shine on her and she escapes being discovered by looters. Later she meets some more looters, a pair of men from two different religious groups, an unlikely alliance in the region around Taglios. The first is Ram, a huge young man; the second, a tattered, wizened little man called Narayan Singh. She overhears them speaking of “the Year of Skulls” and “the Daughter of Night.” When she asks them who they are, they claim to be only deserters from the Taglian army. Despite her suspicions, Lady takes them along with her as she sets off to find any survivors of the Black Company not besieged in Dejagore. With Croaker apparently dead, she is set to declare herself Captain. Gradually, Lady discovers that her new companions are Deceivers, members of a cult dedicated to the worship and freeing of Kina, the goddess of death. By killing enough people, supposedly freeing them from the wheel of reincarnation, they will usher in the Year of Skulls and free their divine mistress. In Lady, they seem to see their prophesied messiah, the Daughter of Night. Lady, a firm unbeliever in any and all deities, sees a point of leverage with them. 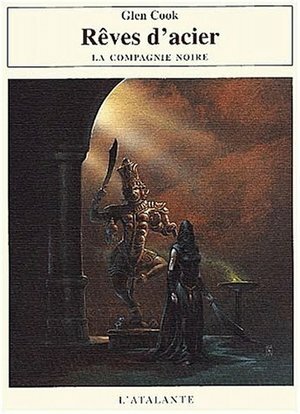 She begins to consolidate her power in the face of uncertain loyalty from her soldiers, uncertain motives from her employer, the Prahbrindrah Drah of Taglios, and the misogyny of the powerful priests of Taglios’ three major religions, using the Deceivers as a hidden and a not so hidden hand. The chapters with Lady are some of the best in the entire series. Croaker, even in some of the Company’s darkest hours, is largely an observer. He’s also at heart a good and kind man. He’s not an innocent, but killing isn’t ever his first choice of solutions. Lady is very different. During her time as empress of the North she did many terrible and evil things. Among people not given to war, and where deadly sorcerers stand ready to conquer, she moves swiftly and forcefully. When it becomes clear most of Taglios’ priests will not submit to dictatorial powers she’s been granted by the Prahbrindrah Drah, she comes up with a permanent solution. “Soul lords of Taglios.” Silence fell. I had that spell right. My voice carried well. “Thank you for coming. Taglios faces a severe test. The Shadowmasters are a threat that cannot be exaggerated. The tales out of the Shadowlands are ghosts of the truth. This city and nation has one hope: turn a single face toward the enemy. In faction lies defeat.” They listened. I was pleased. I donned my helmet while they were waiting for me to announce my abdication. I set the witchfires free. The arrows began to fall. While I was talking Narayan’s picked men had placed barricades in the narrow streets entering the square. When I drew my sword, soldiers inside the surrounding houses let fly. Priests screamed. They tried to flee. They found the barricades too high. They tried to turn on me. My talent was enough to hold them off, beyond my terrified drummers. The arrows continued to fall. They surged this way and that. They fell. They begged for mercy. The arrowfall continued till I lowered my sword. Lady, long little more than Croaker’s romantic fantasy, comes completely into her own in Dreams of Steel. As her magical powers are restored little by little, her confidence grows. Besides simply killing her enemies, she is also playing political games with skills born of ages of experience. It steadily becomes clear why she was so adept and feared a ruler. She’s even completely willing to stain her own hands with other’s blood, participating directly in two assassinations. Driven by her determination to avenge Croaker’s apparent death, she is a dangerous and dynamic power, forcing herself on a society bound up by tradition and sexism. Lady is a magnificently drawn character who will continue to grow in power and depth as the series progresses. Meanwhile, Soulcatcher has forced Croaker to reattach her head to her body in order that she be able to impersonate Lady. As she moves around the region Croaker is dragged along, magically disguised and restrained so no one can learn of his survival. The chapters detailing his captivity do help add some perspective to Soulcatcher’s actions, if not exposing her plans. Soulcatcher, clearly insane, is a funny and often nearly likable character. Her schemes are daring and clever and you almost want them to succeed. Her response when she inadvertently ends up in the Shadowmasters’ custody is awesome. Still, it’s a little disappointing to see the so-recently motivated Croaker reduced to little more than a prop to be carted around from scene to scene. There are other sequences giving the reader insight into the political machinations between the various Shadowmasters as well as those of the Prahbrindrah Drah and his council of advisors. These help flesh out the plotting and counterplotting going on in the two great centers of power, but none of them have the energy or interest of Lady’s or Croaker’s and Soulcatcher’s. As for big action, there’s little of that in Dreams of Steel. There is one significant battle, but it’s a relatively small affair. Mostly, the things that happen are small scale as Lady increases her power and position incrementally. Even though the rise of Lady is very important to the rest of the Black Company series, there’s a holding pattern feel to Dreams of Steel. Croaker is reduced to ineffectiveness and the rest of the Black Company — One-Eye and Goblin in particular — are offstage, trapped in Dejagore. We also keep reading of the horrors of the siege, but we never see what’s really going on. Even when the siege is lifted and the Company’s survivors freed, the event that precipitate some major personnel changes remain unseen. Still, important things are happening. Soulcatcher is revealed as a major, previously hidden, factor. Most of the Shadowmasters are killed off, leaving Longshadow the most important remaining member. The Northerners Willow Swan and Cordy Mather and their comrade Blade are starting to take sides that could set the three friends at odds with one another. The true nature and purpose of the Black Company is finally revealed and it’s nothing anyone in the Company expected: to bring on the Year of Skulls. And of course, there is one major event that, even in this spoiler-filled review, I find myself unable to reveal, that will direct the actions of Lady, Croaker, and the Black Company for decades to come. Obviously, this isn’t a book you can read without having read at least the previous one, Shadow Games. It’s billed as the last of the Books of the South, and the next, Bleak Seasons, as the first of the Books of Glittering Stone. That last, undescribed event, and the revelation of the Company’s purpose, serve as the demarcation between the two series of books. Stick around, and I’ll be back in two weeks with more. (Next week it’s short story roundup time!). 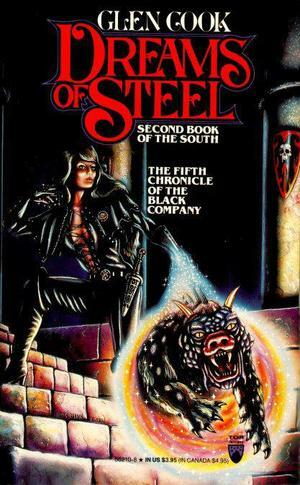 I remember discovering Glen Cook in the summer of 1990, reading all six of the then-extant Black Company books, getting to the end of Dreams of Steel and then having to wait. And wait. And wait. @Joe – I’ve never quite gotten over the frustration of waiting SIX YEARS!! to find out about what happened during the siege of Dejagore. At least with Bleak Seasons he got back on track with reasonably released books thru the end of the series. 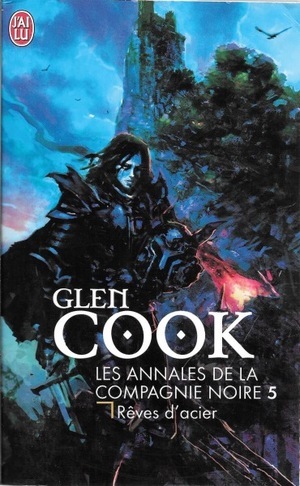 Love that second French cover! This was one of my favourite company books, but also one I found a bit frustrating. The parallels between Kina and Kali, Narayan and the Thuggis, even the Indian names, it just felt like Mr Cook had run out of ideas. Even so the fleshing out of Lady and Soulcatcher was most welcome. I too found myself empathising with Soulcatcher. @Tony – all the French covers are so much better than any of the US covers. I’d be curious to see how popular the books are in France, I mean how do they warrant two separate series of excellent covers? I loved the thuggi stuff. It’s good and creepy and I liked the juxtaposition of the cod-Indian stuff with all the Euro-medievalisms of the earlier books. I’ll write about the gap btw this and Bleak Seasons next time around. Man, it was excruciating. Poor Glen, those covers…. I never read them and I really should give them a go. The new covers are huge change. What the hell was Tor thinking? If I recall correctly, somewhere along in there Glen Cook went from working on the assembly line to working a job that did not leave his brain free to wander. Hence the suddenly slowdown in his writing productivity. @Barsoomia – Since the original covers were done by an artist from St. Louis, and that’s Cook’s hometown, I sort of assumed they were friends or at least con acquaintances. The new US covers are better, but only in relative terms. @Jeff S. – I’ve never heard that, thanks. As I said, I’m a huge fan of the series. But I find the entire Kina storyline (and there’s a lot more coming) hard reading. @Bob – Why? Do you dislike his writing/storytelling or is it the nature of the material? The books coming up are the ones I’ve never reread (maybe Bleak Seasons), so my memories of them are patchy.